(Photo courtesy of Direct Action Everywhere) An activist with Direct Action Everywhere removes Abby, a turkey, from a Norbest turkey farm in Moroni in January, 2017. On Wednesday, six activists involved in the operation were charged with felony theft and burglary. Six activists face prison time for taking a turkey chick from a Norbest turkey farm in Moroni. The activists say they were saving a bird who was on the edge of death due to its inhumane conditions. Each activist was charged with a third-degree-felony count of burglary and of theft Wednesday in 6th District Court by the Sanpete County attorney’s office. According to court documents, the alleged theft occurred in January 2017. The six individuals, members of Direct Action Everywhere, entered the farm and removed the chick. The activists say they did not force entry into the farm. They went through an unlocked door and found animals in deplorable conditions, some sick, others injured. They did not have permission to enter the property or remove animals. The defendants face a maximum of five years in prison on each count. Defendant Jon Frohnmayer said he did not know of the felony exception when he took the bird. But Frohnmayer said it likely wouldn’t have affected his decision. In a way, he said, it’s helpful because the felony makes it higher profile and gives him more of a platform. “I think it highlights the disconnect between the action we took, which is to take sick turkeys to a vet, and the repercussions that other human beings would seek to impose,” he said. However, he said he wouldn’t wish prison on his worst enemies. Sanpete County Attorney Kevin Daniels, who is handling the case, was out of the office Thursday, according to his secretary, and was not available to respond to questions for comment. 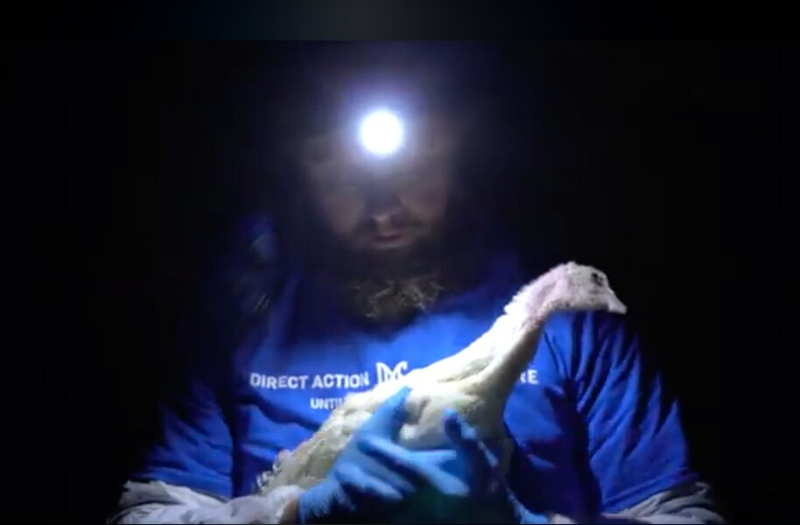 Direct Action Everywhere spokesman Matt Johnson said the charges were brought to deter activists from showing the public the conditions the turkeys are kept in. But the exposure can go both ways. Frohnmayer said the activists will try to get its farm-shot videos in front of a jury. The group has long been investigating Norbest, which markets “mountain-grown turkeys.” Other than Utah’s elevation, the activists say, nothing about the animals’ environment resembles mountains. Videos published by the group show the birds living in a dark building with minimal space to move. In November, Frohnmayer and Johnson rushed a turkey-pardoning ceremony hosted by Gov. Gary Herbert in partnership with Norbest. A short time later, they released video from the farm. In response, Norbest President Matt Cook said that he was disappointed by what was shown in the video, and that it wasn’t the first time problems at the farm have been found. But on Thursday, Frohnmayer questioned why it took activists releasing a video for Cook to acknowledge or condemn the farm’s conditions. Further, he said, the group asked Cook how the Moroni farm differed from the company’s other farms. It received no response, Frohnmayer said. A voicemail message left for Cook was not immediately returned. Frohnmayer said the agricultural community views animal activists as a threat. He doesn’t see it that way, he says, and he wants to be able to build a partnership. “I want us to all work together toward a future where animals don’t need to be harmed for food and for their livelihood,” Frohnmayer said.